Today was one seriously busy day at work for me being Federal Budget day and working for the government, so I'm very glad that I wore this mani on Saturday so I could have it all ready for tonight. It also coincided with a birthday party I attended for one of my nephews on Saturday - cause these really are birthday looking nails! 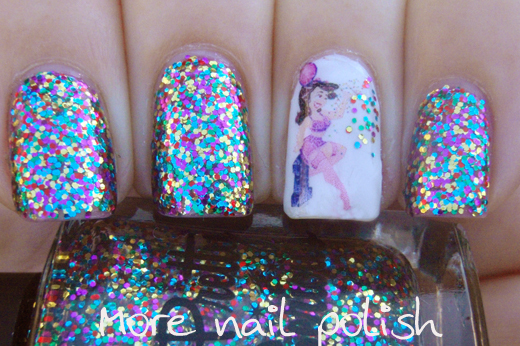 Here I'm wearing three coats of Daphne's Birthday Party with a little feature nail of Daphne herself throwing a bit of the glitter confetti in the air. I created the image with temporary tattoo paper. This was one of my last scraps of tattoo paper before opening a new sheet, and it's got some finger prints on it, which means the ink doesn't transfer as well and it looks a little patchy, but it's still easy to see what it was. Oh what a splendid idea yours is! 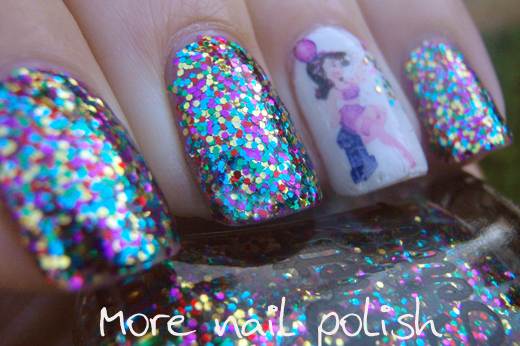 Love that you've used the polish for a little bit of sprinkling glitter action! I'm sure Daphne would love this! I do love it so much!! :D great job! gorgeous! I love your little Daphne. Did your nephew notice? Love your Daphne, so gorgeous! 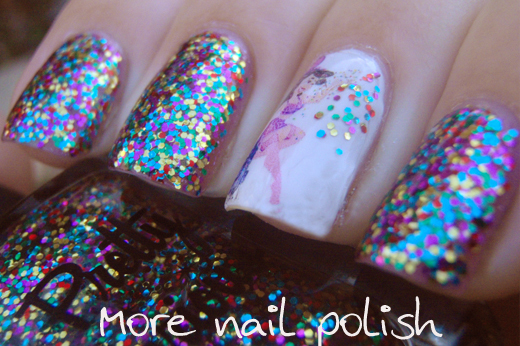 This is such a fantastic nail polish! I love your feature nail. I also participated in the celebration. OMG!! The tiny Daphne is gorgeous! The Daphne accent nail is just inspired! Doing my mani now (I am in the US where it is still the 14th) and will be sharing soon. Happy birthday, Daphne! AWWWH thats so awsome you did that for them! !